As I watched all this in a programme on Discovery channel, I could not make a control over my excitement and I packed my bag for Agra. On arriving this renowned city in the state of Uttar Pradesh, I came to know that this erstwhile capital of the Mughal empire is a vibrant centre of culture, art and religious philosophies. My driver, Tahir, told me that its original name was Agrabana, a forest that finds mention in the epic Mahabharata. Being one of the seven wonders of the world, the Taj Mahal serves as an inspirational source to various artists, painters, sculptors, poets and photographers. I found this pure white marble monument standing on the banks of the River Yamuna. The main monument with the huge and impressive dome, has four minarets in each corner towering up to 40 meters. And its divine beauty is not only limited to just the outside view but the intricate carvings are also beautiful and fascinating. As soon as I entered the monument, I saw an elevated central chamber below which is the burial chamber. The inner beauty of the Taj Mahal seems at its best with two levels consisting of eight rooms each, which were used to bury other members of the royal family. I was overwhelmed to see the crypts of Shah Jehan and Mumtaz lying side by side with the heads facing in the direction of the holy city of Mecca. Both the crypts are beautifully decorated with inscriptions from the holy book Quran. The guide there told me that once these crypts and almost all the walls of the monument were studded with precious stones and gems. Still I could see the best of drawings like vines, creepers with flowers and other beautiful designs. Another fascinating element inside the monument is the marble screen or ‘Jali’ surrounding the crypts. 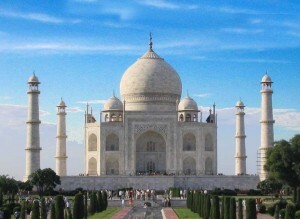 Taj Mahal is undoubtedly the finest example of Mughal architecture. One can see a lot of diversity here as the architecture is highly inspired from Persian, Indian and Turkish architectural patterns.